Welcome to our Fiesta Latina! Hot from the HBTS Newsroom, here’s the latest gossip to get every Harpin’ By The Sea fan texting, twitfacing and nattering; the theme for HBTS9. While this summer’s bun-burning blitz will finally have abated by February, we’re all set to cook up our very own chilli-fuelled fire storm at HBTS’s Fiesta Latina. This year we’ll be rocking the rumba, sizzling the salsa, cooking the candombe and mixing up some mambo mayhem in the expert hands of two very, very special guests. And yes, it’s all on the diatonic harmonica. Tickets for our workshop and show package will be on sale from Saturday 1st September 2018, so don’t miss out. So without further ado, and flying in all the way from Montevideo, Uruguay, for his UK debut, here is our first special guest, Señor Fede Vaz to say hello to you in person. Check out the chops on this one people.. ay caramba! 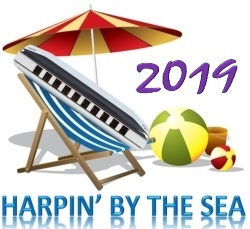 Harpin’ By The Sea 2019.. Turn up. Dig it. Tell ALL your friends!